Well, actually three different Peace Clock Sweepstakes beginning on three successive weeks. This is the third of three sweepstakes, so hurry and enter our latest sweep for a chance to win our Flower Power Clock. 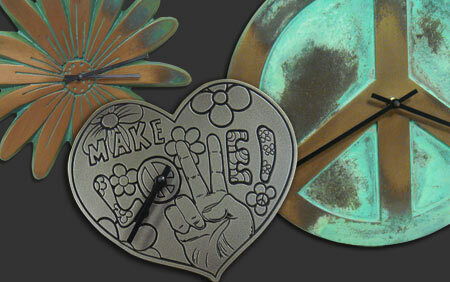 The prize is our Flower Power Clock finished in our Copper Verdi finish which sells for $142.00. The Flower Power Clock is designed to bring back memories of those [mostly] peaceful campus protest days when all that was needed for a grand time was some friends, a little toke, and a little joke, and a good cause. Mix in some over zealous police, teargas, rocks, and burning tires, and…what a party! Ok, just having flashbacks, the Flower Power Clock is also a great gift idea and will put a daisy in your favorite spot. This is real wall art! We would like to be able to say that just putting a flower in your hair or participating in peaceful resistance will improve your odds, but you actually have to enter to win. Kind of like the lottery! 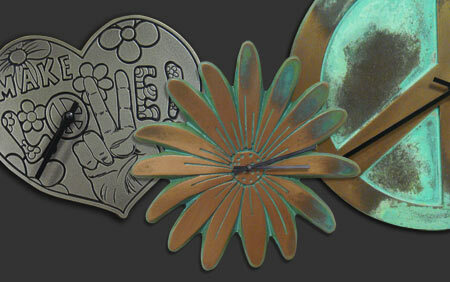 THE PRIZE: Atlas is giving away the Flower Power Clock in our Copper Verdi finish. Winning could get your holiday gift shopping off the ground, but you might just want to keep it for yourself! This is the last of three Peace Clock Blog Giveaways. Just look at the photo to see the two prizes for the sweepstakes that have ended. The Peace Sign Clock, and the Symbols of Peace Clock sweeps have ended but you can still buy them at Atlas Signs and Plaques. You get one entry just by leaving a comment on this blog post after window shopping the Clocks Category and helping us out by telling us your favorite clock in your comment. Contest Dates: Begins now and ends on Wednesday, October 21st, 2010 at 12:00 noon CST. The winner will be announced on October 21st. We use a random drawing to select a winner, and get your free prize out to you real fast! There are no catches or tricks. Leave a valid email address on each of your entry comment(s). We will not share, sell, or giveaway your information. Open to residents of the US only. This entry was posted in NEW - Be in the KNOW and tagged clock, contest, Free, gift, Giveaway, New, Peace, sweepstake, winner on October 13, 2010 by AtlasSigns. Atlas Signs and Plaques announces the winner of the Second of Three Clock Giveaways – the Peace Sign Clock! Thanks to all that participated. Remember, this is the second of our three part giveaway! Congratulations to: DEBIJOT, (comment #58), who commented on October 11th, “left message on my fb page”. You are the winner of the Keep the Peace – Peace Sign Clock! Please leave a comment on this blog post letting us know you accept your prize! Stay tuned for the Flower Power Clock which will be our final Peace In Our Times Clock Giveaway. This entry was posted in NEW - Be in the KNOW and tagged contest, Free, Giveaway, Peace, sign, verdi, winner on October 12, 2010 by AtlasSigns. 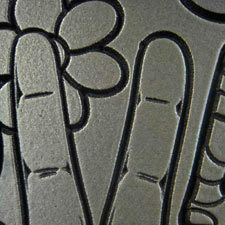 Here is the 2nd of 3 Peace Blog Giveaways from Atlas Signs and Plaques. 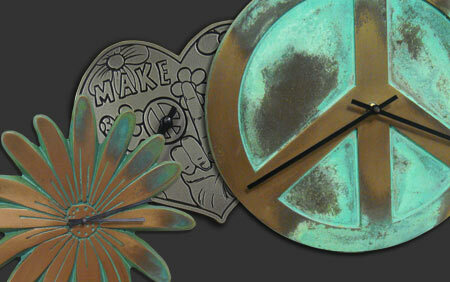 Atlas has promised Peace In Our Times in the form of Blog Giveaways, each one featuring a different Peace Sign Clock. There is (at least) one more to follow. So, stay tuned for it, and all of our future giveaways by subscribing to our RSS Feed. You will receive notification of all of our Blog Giveaways and you won’t miss a thing. The Second Peace Clock to be given away is our Keep the Peace Clock. Interestingly, the now well-known International Peace Symbol has its roots in the anti-nuclear protests in the 1950s and 1960s. It has taken on a new, much broader life as one of the most recognized icons of this century. We like to say that there is always time to make peace, so we added a quartz clock movement to the beloved Peace Sign. And now, you can win it to keep for yourself, or to give as a great Christmas Gift! 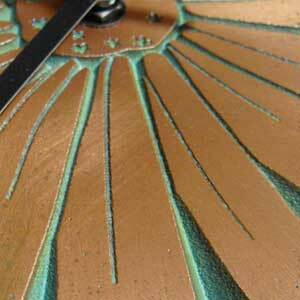 THE PRIZE: Atlas is giving away the Keep the Peace Clock in our Bronze Verdi Finish. Remember, this is just the second of three Peace Clock Blog Giveaways. Just look at the photo to see our last, and next blog giveaway. The Peace Symbols Clock blog giveaway is history, but the Flower Power Clock will be our next giveaway. You get one entry just by leaving a comment on this blog post after window shopping the Clocks Category and helping us out by telling us your favorite clock in your comment. A “why” would be fun, but not necessary to win. If you have a brief story about hiding under your desk (that will date you), participating in a peace protest, or just getting caught up in the fervor, please include it. True stories are the best entertainment. Contest Dates: Begins now and ends on Tuesday October 12th, 2010 at 12:00 noon CST. The winner will be announced on October 12th. 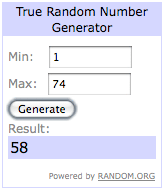 We use a random drawing to select a winner, and get your free prize out to you real fast! There are no catches or tricks. Leave a valid email address on each of your entry comment(s). We will not share, sell, or giveaway your information. Open to residents of the US only. This entry was posted in NEW - Be in the KNOW and tagged clock, contest, Free, gift, Giveaway, New, Peace, winner on October 6, 2010 by AtlasSigns. Atlas is promising Peace In Our Times. Well, actually three different Peace Clock Blog Giveaways spaced over the coming weeks. So, stay tuned, or better yet, subscribe to our RSS Feed so you will receive notification of the latest Blog Giveaway. 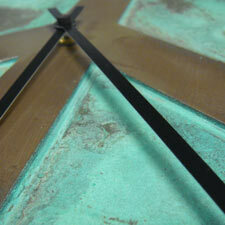 The first Peace Clock to be given away is one of our newest creations, The Peace Symbol Clock. How many symbols of peace can you get on one clock? You might have to bring in an aging hippie friend to help out, but we may have set the record with this one! Ok, we will help you out if you read the next paragraph. Did we miss any? The Peace Symbol Clock has the International Peace Symbol so familiar to all, the Hand Gesture Peace “V” Sign of Peace, Flower Power Peace Symbols, and the “Make Love” phrase. And it is heart shaped! All we can say is Far Out!! THE PRIZE: Atlas is giving away the Symbols of Peace Clock in our Silver Nickel finish. Winning could get your holiday gift shopping off the ground, but you might just want to keep it for yourself! But remember, this is just the first of three Peace Clock Blog Giveaways. Just look at the photo to see Peace Sign Clock, and the Flower Power Clock that will be our next giveaways. Contest Dates: Begins now and ends on Tuesday October 5th, 2010 at 12:00 noon CST. The winner will be announced on October 5th. We use a random drawing to select a winner, and get your free prize out to you real fast! There are no catches or tricks. Leave a valid email address on each of your entry comment(s). We will not share, sell, or giveaway your information. Open to residents of the US only. This entry was posted in NEW - Be in the KNOW and tagged clock, contest, Free, gift, Giveaway, New, Peace, winner on September 29, 2010 by AtlasSigns.